The Face filter is basically a copy of the "beautification" tool seen in manufacturer and third-party camera apps for quite a while now. It will highlight detected faces in a photo and offers skin smoothing and "eye clarity" adjustments in the swipe-based adjustment interface. 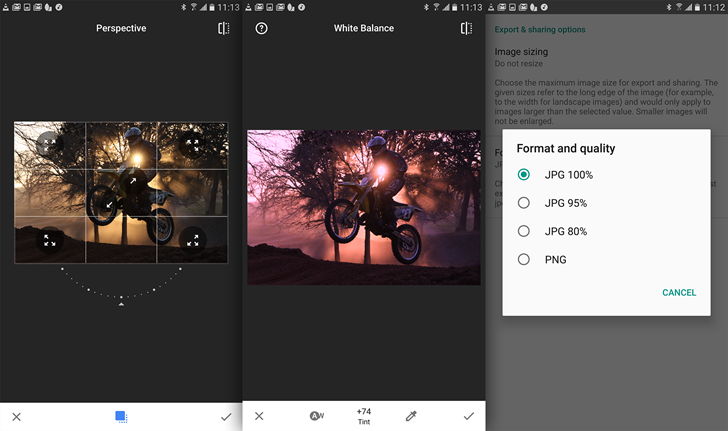 White balance can now be adjusted in terms of temperature and tint, and the Perspective tool allows for stretching and skewing photos with a grid-style overlay. Photos can now be saved in either lossless PNG format, or with varying degrees of JPG compression. Other changes are under the hood if they're present at all. New users should see the updated version of Snapseed in the Play Store, but if for some reason you can't see it, the app is also available over on APK Mirror.